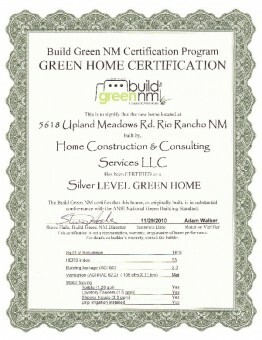 Building Green is more the result of a mind-set than the result of a certification. Building Green broadly encompasses things such as the preservation of the exterior environment of your home, consideration of the interior environment of your home, energy conserving appliances, windows and doors, water saving and low usage devices, orientation of your home to maximize the benefits of solar gain in the winter months and minimize solar gain in the summer months. Building Green principles entail the use of recycled or man-made materials when possible and the attempt to minimize and eliminate waste throughout the construction process. 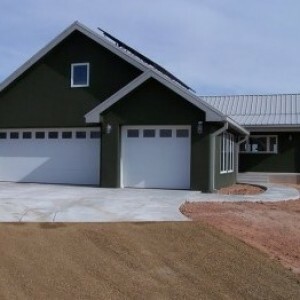 Green Building means a lot of different things and the topic is constantly evolving, as an example, some of the requirements to obtain tax credits in the State of New Mexico are currently being changed. Yes, you are eligible to receive tax credits for acheiving certain requirements, both federal and state, and there are a host of other incentives that are also available as an incentive to build with thought toward the future, and not just, what can we do today. 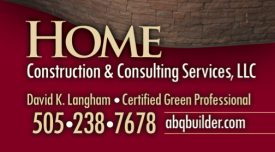 The best thing that you can do if you are interested in Green Building is meet with a knowledgeable General Contractor and make the determination before you even begin to think about starting house plans as to what exactly it is that you truly desire to do and accomplish. Building Green does not mean that you must adhere to a specific set of rules and guidelines or your project is a failure. Obviously, a cellulose type of insulation sprayed into your wall spaces (made from recycled newspaper, for example) is more green than using traditional fiberglass batt insulation. However, your budget may dictate using fiberglass batt insulation in lieu of sprayed cellulose, and thats O.K. You can still work toward the goal of having a nice, tight home that is well insulated and that will be built with energy conserving principles in mind. Green Building does not mean that you will have to spend significant additional amounts of money to build your home, however, as just alluded to, some principles of Building Green will indeed incur some additional expense over traditional methods of construction. However, in many instances, it is possible to determine how long it will take to recoup those additional costs and exactly how those costs will be recovered. 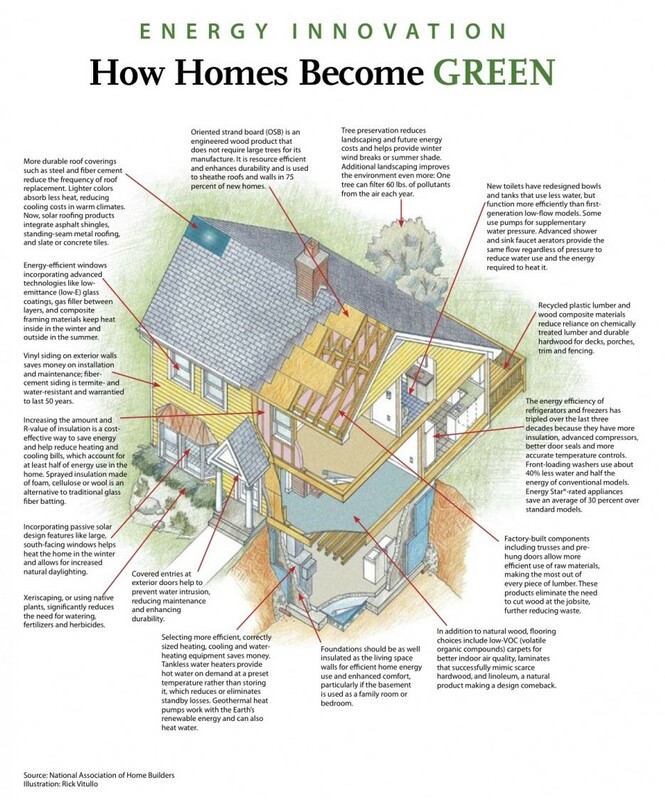 Below is a brief primer and diagram on what you should expect and begin looking for when Building Green.